One of our success stories lies the Moreno family in Bogota, Colombia. The family came to us for help in 1996. The family and their three boys live in a very poor neighborhood on the out-skirt of Bogota. The mother is a cancer patient and the father is a handy man with limited work and education skills. They were unable to educate their children Alfredo, Pedro, and Mauricio. The Colombo-American Education Foundation gave these children the opportunity for a bright future. Today the boys are high school graduates. Alfredo came to us at the age of 14 and was with CAEF for Three years. He obtained a high school diploma and is presently working. 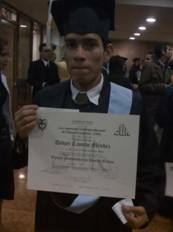 Pedro came to us at the age of 12, Five years with CAEF, and obtained his Degree in Computer Systems. 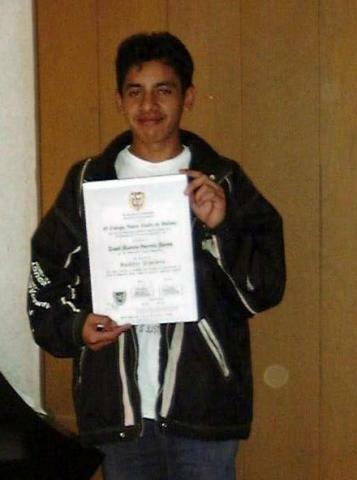 Mauricio came to us at the age of 10, Seven years with CAEF, and obtained a high school diploma. Because of the generosity of CAEF, this family has three educated children that are productive members of society. "The purpose of my letter is to let you know my educational progress for which I have been blessed by your organization. Today I am attaching a copy of my degree of Computer System Technician. I feel proud of myself to have accomplished my educational goals. It has been important to demonstrate my accomplishment that I worked very hard to obtain. I sincerely thank you for your help during all these years. I do not know what would have been of me without your help. I will like to keep in touch; please do not hesitate to call. I would like to know other young kids in your program that have also achieved their goals like me. God bless you and your families." A thank you letter from Jamir Pascuas Quimbaya(translated), who graduated in 2009 as Occupational Technician of Petroleum Production from The Petroleum Institute. CAEF gave him a 5 year educational scholarship. That my God blesses you one thousand more times! I thank God that you appeared like an angel in my life when I most needed someone. Because through your invaluable help with the scholarship you provided I am starting to striated-up my life. Regarding my studies, I want to tell you that I tried very hard to do well notwithstanding the various difficulties and roadblocks that I have had in my way. 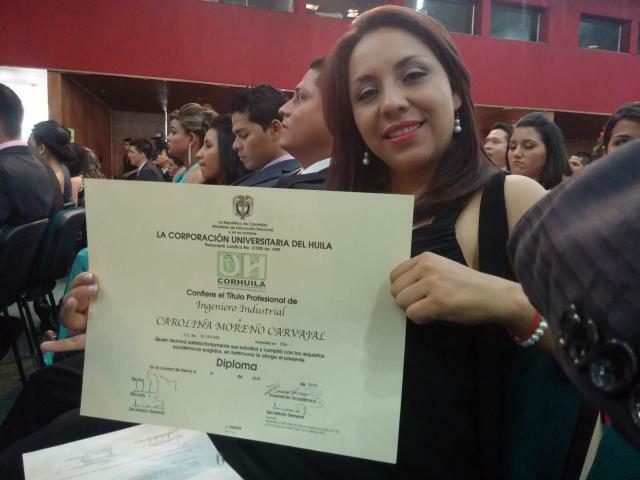 As if March 02, 2008 I obtained my degree in Occupational Technical Certificate in the production of oil wells at the Petroleum Institute "TEPEINS' in Neiva. I also want to tell you since May 1st 2008 I was able to obtain a job at the KAPPA COMPANY RESOURCES because of my education and some help from my cousin that is also working for the company. The salary is not much for now but the important thing is to gain experience so I can get a better and higher place of employment in the future. Dona Margarita I hope that very soon, I can meet with you personally and I can thank you for everything you have done for me. May God bless you and take care of you so you can continue spreading good and sacred seeds among us. 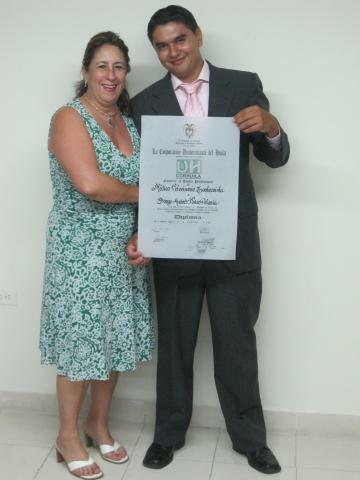 Jorge Andres Tovar Polania received a Doctor Veterinarian & specialization in Zoology 2009. CAEF granted him a 5-year University scholarship. 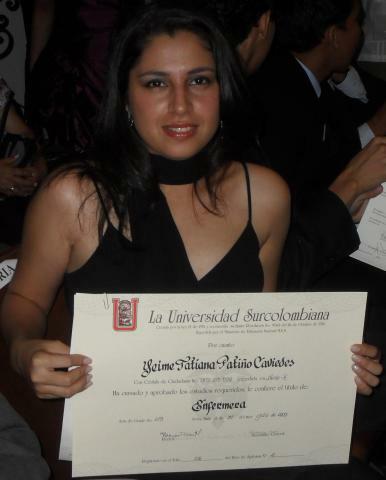 Yeimi Tatiana Patino Cadavides received a Bachelor degree in Nursing 2009. CAEF granted her a High school education and 4-year University scholarship. 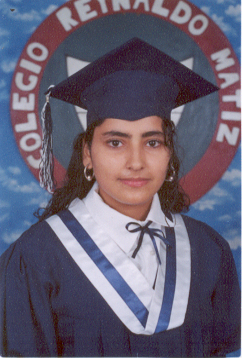 Mayra Ortiz 2005 High school Graduate CAEF granted a 6-year high school scholarship. Pedro Moreno received Bachelor in Computer Systems 2005. CAEF granted a 3-year Trade School scholarship. CAEF granted a 4-year University scholarship Camilo Mendez Bachelor Didier received a Bachelor Degree in Graphic Design 2006. CAEF granted a High School education and a 3-year Trade School scholarship.